The two most common types of the perennial bleeding heart are the old-fashioned bleeding heart (Dicentra spectabilis) and the fringed bleeding heart (Dicentra eximia or Dicentra formosa). The old-fashioned bleeding heart grows 2 to 3 feet tall, has showy pink or white heart-shaped flowers and green leaves in groups of three. The fringed varieties may reach 18 inches and have small red, pink or white flowers. Their foliage is fernlike. The most efficient means of propagation for both types is division. Divide the old-fashioned bleeding heart after it dies back in the summer. The fringed bleeding heart responds better to division in the early fall. Propagating by seed and root cuttings are options, although a slower process. Water your bleeding heart well the day before dividing it, if the weather has been dry. For the old-fashioned bleeding heart, slowly pour approximately 2 gallons of water near the base of the plant, letting the water drain after each gallon. Fringed bleeding hearts need less water, approximately a gallon. Divide your bleeding heart in the morning while the temperature is still cool. The old-fashioned type has thick roots and a large root ball. Place the shovel about 6 to 8 inches away from the edges of the plant and dig down 8 to 10 inches, angling the tip of the shovel upwards as you dig, following the circumference of the plant. Dig down 4 to 5 inches for the fringed bleeding heart. As these types grow from rhizomes or underground roots, you may not be able to get a defined root ball. Lift the clump and lay it on its side in the shade. Pull the excess soil gently away from the roots. Take the knife and cut through the crown or base of the plant. According to a garden tutorial from The Environmental News Network, each division of an old-fashioned bleeding heart should have three to five "eyes," which appear as budlike areas within the crown area. 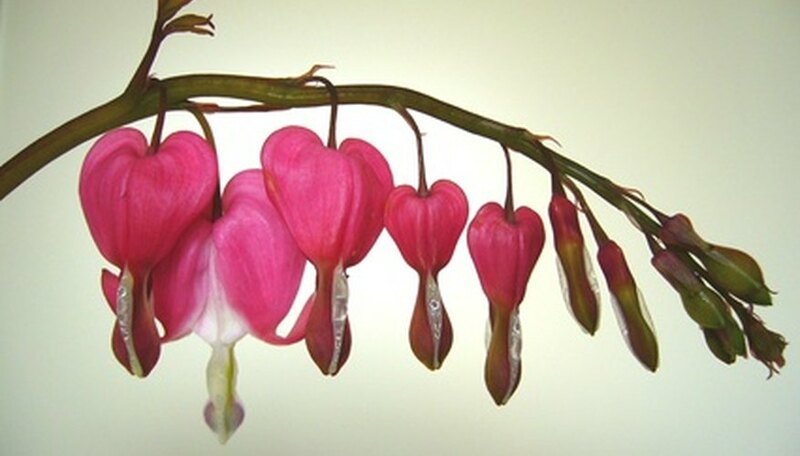 The fringed bleeding heart has eyes as well, but they are quite small. Make sure each division has an equal amount of roots. Transplant your divisions as soon as possible into their new locations. Bleeding hearts prefer sun to partial shade and a moist, rich soil. Turn over the soil where the divisions will go and amend with the bag of planting mix and mix in well. Dig the holes deep enough to accommodate the roots of each division. Plant your divisions so that the top-most eyes are covered by 1/2 inch of soil. Water with approximately 1/2 gallon per division. Place your divisions in the plastic pots with moist soil around the roots if you're planning to give them away. Chill old-fashioned bleeding heart seeds for six weeks at 41 degrees, according to Michigan State University Extension. Chill fringed types for three to four weeks at the same temperature. Plant in the plastic pots, using the seed-starting mix. Sow and cover with 1/4 inch of soil. Water until the soil is moist but not saturated. Keep moist. Germination takes approximately six weeks. Winter the pots in a cold frame or sink them in the ground and mulch with straw. Transplant in the growing season when the seedlings are about 4 inches tall. Take root cuttings when your bleeding heart is dormant. Dig down 6 to 8 inches as in Section 1 and lift the clump. Prune off 3-inch sections of large, healthy roots. Place lengthwise in a tray of planting mix under 1/2 inch of soil and water until the soil is moist. Set outside. The cuttings should be ready to transplant in three weeks. This method is not used with the fringed bleeding hearts as the roots aren't large enough. The old-fashioned bleeding heart self-propagates. Leave the seed pods on the plant and let the seeds fall to the ground. The fringed-leaved types spread by rhizomes and will fill in an area. Although the National Gardening Association advises against dividing bleeding hearts, anecdotal evidence in forum posts on the Garden Web suggests that bleeding heart plants divide easily and with success. It will take a few years for seeds to produce plants mature enough to flower. The roots of bleeding hearts are easy to break when lifting clumps or dividing into sections.